Sweat, the global health and fitness technology company, continues to redefine the health and fitness industry for women with the Sweat app now available on Apple TV. Over 30 million women around the world have used the Sweat app on mobile devices and wearables alike – now users can also workout with Sweat trainers Kayla Itsines, Kelsey Wells and Sjana Earp on their big screens at home. “At Sweat, we’re passionate about providing women with premium health and fitness content with the utmost flexibility in where, when and how they access it. We’re very excited to now bring this same experience to women on the big screen in the comfort of their homes through the Apple TV platform – giving our community another way in which they can enjoy their workouts,” said Sweat CEO Tobi Pearce. Through Apple TV, workouts are easy to navigate and our existing app features such as trainer audio cues and exercise video cues are further enhanced. “What’s also great about the Apple TV platform is that it provides users the opportunity to workout with friends or fitness partners, as more than one person can complete a workout at one time. This encourages users to workout together and support one another on their health and fitness journey’s. As we know at Sweat, fitness is social,” Mr Pearce said. 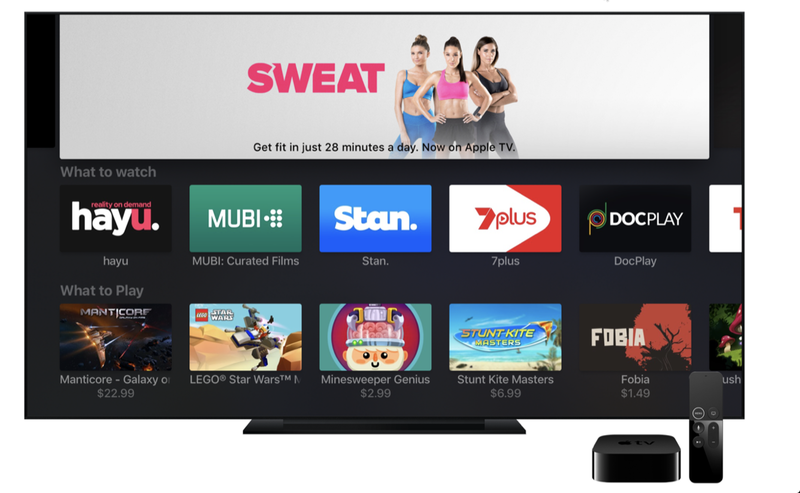 First time users can sign up to the Sweat app directly through their Apple TV using their Facebook account or email address. While existing subscribers can login using their Facebook account, email address or activation code. Users have the option to utilise their subscription across mobile, desktop, Apple Watch and Apple TV devices, ensuring seamless user experience across the whole Sweat ecosystem. The Sweat App is available to download for $19.99 per month or $119.94 per year from the Apple and Google Play stores.